The Wessex Strut invite you their annual Fly In at Henstridge. PS. It is also Easter Saturday and the start of the new Dr Who season. Make sure you check the web page before flying in. There is a special offer which will save you money. Many thanks to everyone who came, and I hope you enjoyed yourselves. We were hit by unimaginably fabulous weather, and about 140 aircraft flew in. The timing of the comings and goings meant that we had about 139 visiting aircraft on the ground at the same time. We had an overflow aircraft parking and that overflowed - at about the same time as the chief marshaller went down with sunstroke. So apologies if the organisation got a bit ragged at times. Much delayed by the vis in extreme Kent, but got there in the end. Whoever organised the weather is invited to volunteer to set dates for all future events everywhere. My own fault I didn't claim my free landing. thanks for a good fly-in. however there seemed to be some problems! I registeredfollowing a link to an email address george@wessexstrut..... this was in an email someone sent me about the fly-in. but when I got to book in, I wasnt on the list of pre-booked aircraft, the person just before me had the same problem, it seems they wanted you to phone rather than email to be on their list. I suggested they add me to the bottom of their list which they did, but the person before wasnt so lucky and was charged. Hopefully this can be sorted for next year, emailing is by far the best choice if you ask me. I got there at 1pm and had no problems walking around the aircraft park looking at the aircraft and chatting to my friends, but had a report from others saying they werent allowed in the aircraft park until 1pm (they had arrived by road) and even arriving pilots werent being allowed to stay in the aircraft park!!?? Is this really true? 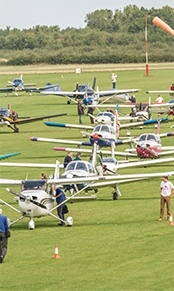 After all the main reason of going to a fly-in is to look at the other aircraft and see your mates who have also flown in, or arrived by road? hopefully next year unrestricted access to the aircraft park for all those who flew in or are LAA members. I know its not up to you, but up to those running Henstridge.